Here are some recommendations for getting the most out of Solargraph. The sample screenshots are taken from Visual Studio Code. 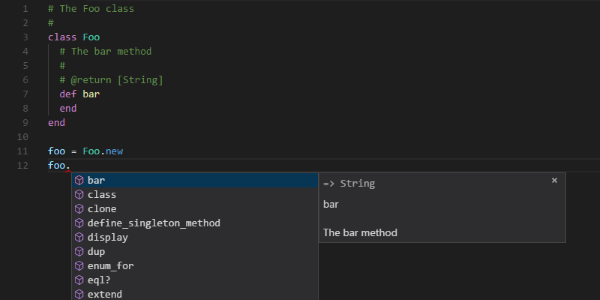 The descriptions for the Foo class and the bar method will appear in VS Code's quick info window for their respective completion suggestions. The @return tag in the bar method's documentation is especially useful. Solargraph uses it to provide String method suggestions when you chain methods, e.g., Foo.new.bar. There are many other YARD tags that Solargraph can use to improve suggestions, such as @param and @yieldparam. See the YARD tag documentation for more information. Solargraph can provide completion and other features for gems that have YARD documentation. To document your gems, run `yard gems` from the command line. The VS Code extension provides shortcuts for generating the documentation from the command palette. The Solargraph server looks for a .solargraph.yml at the root of a project for configuration settings. In the VS Code extension, for example, the .solargraph.yml should be in the root folder. Go to the project root and run solargraph config. A list of directory globs to include in Solargraph's code maps. The default configuration includes all .rb files in the folder. A list of directory globs to exclude from Solargraph's code maps. The default configuration excludes the spec, test, and vendor folders. Use require to add require paths that are not explicitly defined in code. Solargraph will act as if a file in the project contained the line require 'sintatra/base'. Use reporters to configure diagnostics. Current valid reporters are rubocop and require_not_found. rubocop provides RuboCop linting. If your project has a .rubocop.yml file, Solargraph will use it to configure the linting rules. require_not_found reports required paths that could not be resolved to either a project file or a gem. Warning: The runtime plugin is highly experimental and prone to bugs. The maximum number of files to be mapped in the workspace. If the workspace exceeds the maximum, the language server will still map individual files opened in the client. The limit can be removed altogether by settings max_files to 0.